Today, state of Washington resident Steve Marsh officially the first Nissan LEAF owner in the US to surpass 100,000 miles. Amazingly, it took Marsh only 31 months to achieve this feat. In celebration of the odometer clicking over to show 100,000, Marsh met in Tumwater, Washington with representatives from Nissan, Washington Governor Jay Inslee, State Transportation Secretary Lynn Peterson and EV drivers in the area who showed up to congratulate Steve. 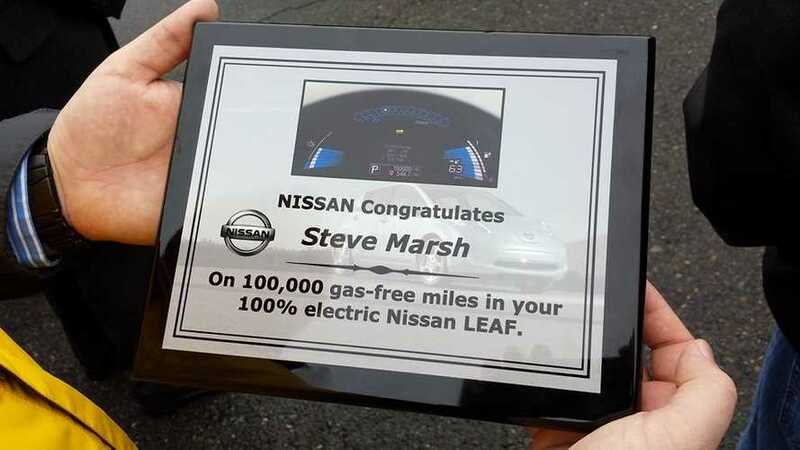 As the images show, Marsh received a "Washingtonian of the Day" award, a commemorative plaque from Nissan a free quick-charge and a title that only Steve will ever hold: World's first Nissan LEAF driver to surpass 100,000 miles. *You'll find a few more specific details on the event in the press release at the bottom of this post. OLYMPIA – Washington Gov. Jay Inslee, state Transportation Secretary Lynn Peterson and representatives from Nissan today joined Steve Marsh of Kent., Wash., to celebrate a unique milestone – 100,000 all-electric miles driven in his Nissan LEAF. 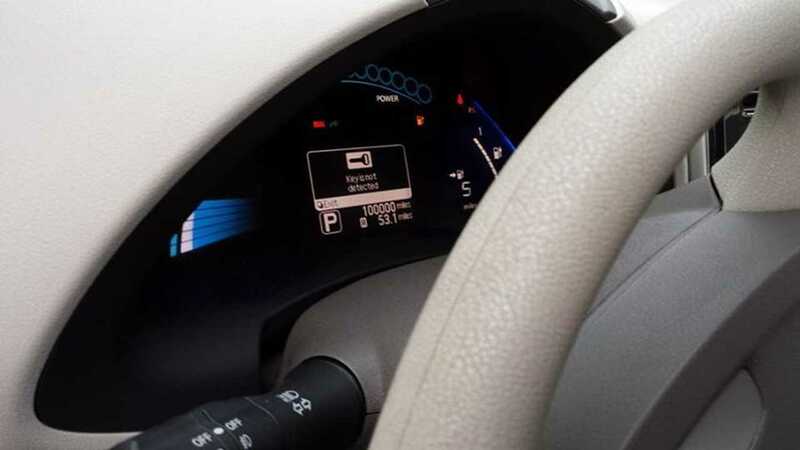 In early 2011, Marsh purchased an all-new Nissan LEAF for his 130-mile roundtrip daily commute. Since then, he has racked up 100,000 miles on the car, using no gasoline, creating no tailpipe emissions and, by his estimation, saving thousands of dollars. Marsh was one of the first customers to take delivery of a Nissan LEAF in Washington. A financial controller for Taylor Shellfish, he made the decision to go electric and buy a LEAF primarily based on the car’s low cost of ownership—a benefit that more than 40,000 American LEAF drivers are also now enjoying. 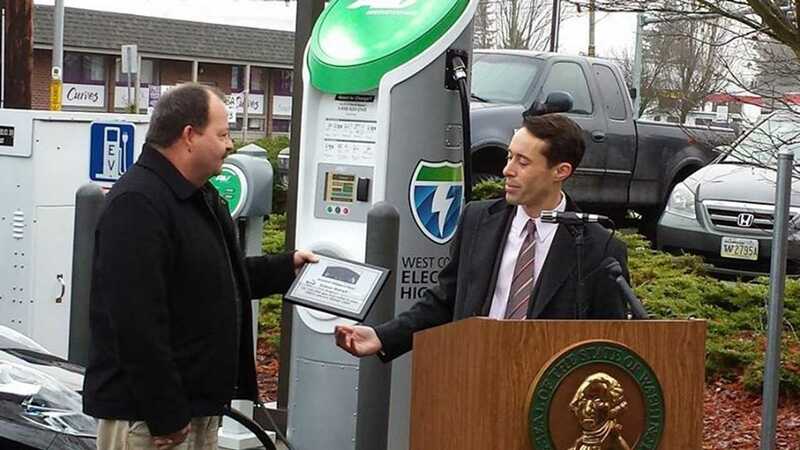 To support residents like Marsh and speed the adoption of electric vehicles in the state, Washington developed one of the country’s most robust EV charging networks. The West Coast Electric Highway opened last year giving EV drivers range confidence that they can find easy and convenient charging along Interstate 5 and other roadways. With a full charge in about 30 minutes, the fast charger at the Tumwater Shell station is a regular stop for Steve Marsh and his son Christopher, making it possible to carpool to work in an all-electric car. 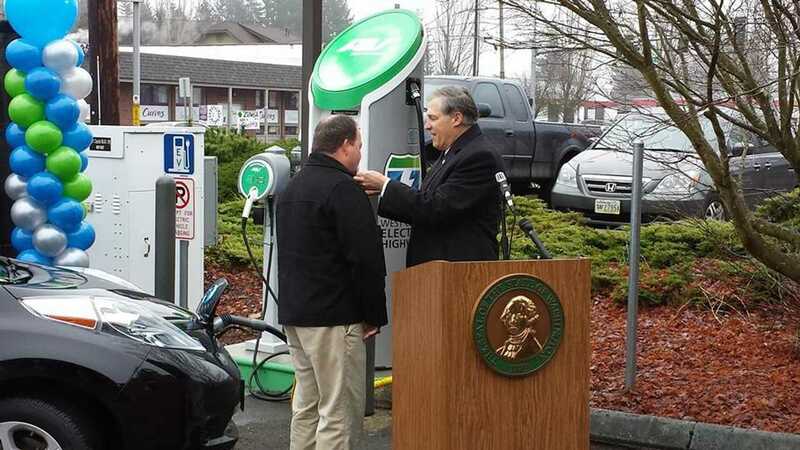 When Marsh bought his LEAF, he approached his employer to consider installing a charging unit for public use at his Taylor Shellfish office in Shelton. His management quickly agreed it was a good idea, he said, especially since it aligns with the company’s environmental philosophies. His was among the first businesses in the region to install a public charging station. Since then, the company has added charging at its shellfish hatchery in Quilcene, along the Hood Canal. More than 5,000 plug-in-electric cars are already registered in the state. Washington has among the cleanest and least expensive supply of electricity in the nation, making it an ideal place to drive electric. It’s good for the environment, it’s good for the state, and it’s good for drivers. In addition to the lower operating costs of driving on electricity compared to gasoline, EV drivers also enjoy fewer routine maintenance costs. Since the launch of Nissan LEAF in December 2010, Nissan has sold more than 40,000 all-electric LEAF cars in the United States and more than 92,000 globally. Through November in 2013, Seattle-Tacoma is one of the top U.S. markets for total LEAF sales with an increase of more than 230 percent over the same period in 2012.